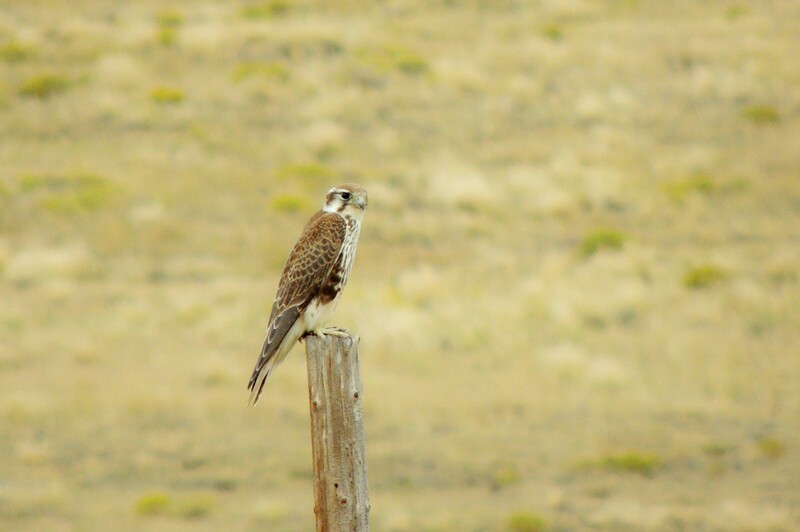 This Prairie Falcon couldn’t have been more cooperative! Today we birded the Pawnee National Grasslands in northern Colorado. We had many great birds and found many of our target species. Unfortunately, we must have been a little late for Longspurs. We found none of either species in a full day of searching. We did have some nice finds and excellent views of the birds. 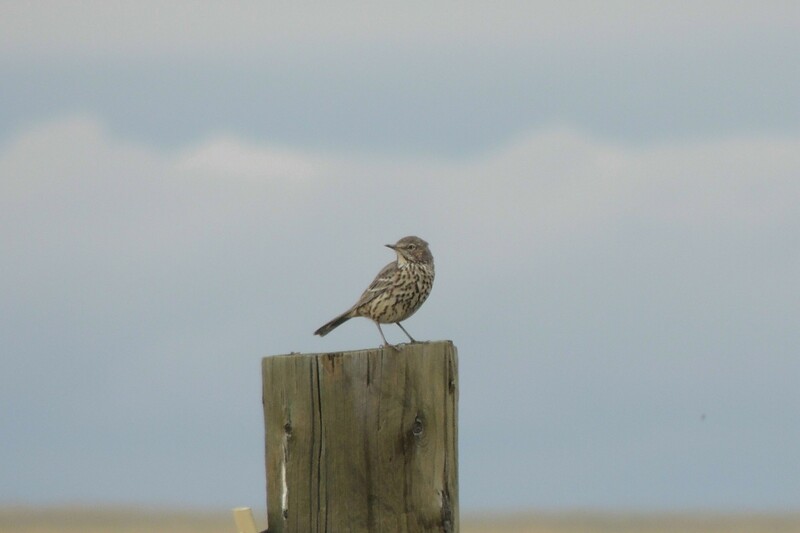 Highlights of the day included: Burrowing Owl, Yellow-headed Blackbird, PLUMBEOUS VIREO, Western Tanager, SAGE THRASHER, Vesper Sparrows, Clay-colored Sparrows, Rock Wren, Horned Lark, Western Meadowlark, PRAIRIE FALCON, FERRUGINOUS HAWK and many more! For me, the killer views of the Prairie Falcon were the highlight of the day. From the grasslands, we moved on to Longmont, Colorado where we will be stationed the next three days. Rocky Mountain National Park will be our first destination in the morning. This morning we awoke to an emergency situation in Longmont, Colorado. The Weather Channel has referred to it as an Epic Event of Biblical Proportions. 15 Inches of rain fell on Boulder County in just 48 hours. That is a total of 5.3 Billion gallons of water on a single county. The entire state was subject to similar circumstances. A dam had broken/burst overnight, washing away several homes and killing three people. This was all only ten miles from us and we were forced to leave the area with extreme flash flooding and heavy rains predicted for the next couple of days. Just south of us a fourth person perished in the flood. Our condolences and prayers are with the people of Longmont. We moved south as quickly as we could in torrential rains. Once we reached southern Colorado, we caught a break and the rain stopped for several hours. We managed to bird two excellent locations during the afternoon. Pueblo Lake State Park in Pueblo and Lathrop State Park in Walsenburg. We had some great birds. CASSIN’S KINGBIRD, Bushtit, Clark’s and Western Grebe, WESTERN SCRUB-JAY, Spotted Towhee, BROAD-TAILED HUMMINGBIRD, LADDER-BACKED WOODPECKER, Lesser Goldfinch and many more. We managed to have a good day before the rains started again around 5pm. We are forced to leave Colorado entirely since the forecast continues to be bleak. Tomorrow we will bird one area near Trinidad, Colorado and then move on to New Mexico and Texas. This morning we birded Trinadad Lake State Park in Trinidad, Colorado. It was really a nice park and we had many birds. Highlights of the location included Clark’s Grebe, Western Tanager, Cassin’s Kingbird, WESTERN BLUEBIRD, Baltimore Oriole, Black and Forster’s Terns, Blue Grosbeak and Plumbeous Vireo. When we finished there, we moved on to New Mexico. Our first stop there Sugarite Canyon State Park. We had many Stellar’s Jays, Yellow-rumped Warblers, White-throated Swifts, Rufous and Broad-tailed Hummingbirds and Lesser Goldfinches. We then moved on to Capulin Volcano National Monument. This is an old Volcanic cinder cone that rises 1,300 feet above the prairie floor. It was a really nice stop and besides the great views, it was quite birdy. We had CALLIOPE, Rufous and Broad-tailed Hummingbirds, House Finches, Rock Wrens, Peregrine Falcons, Western Wood Pewee and Spotted Towhees to name a few. From here we continued to Clayton State Park. We had many of the same species but also CHIHUAHUAN RAVEN, Osprey and Blue-gray Gnatcatchers. The highlight of this spot were the DINOSAUR TRACKS! There are tracks of 8 species of dinosaur, including both herbivores and carnivores. There are also tracks of a baby Iguanadon, which is an extremely rare find anywhere in the world. Infant and juvenile dinosaurs almost never left tracks that could be preserved by nature. We had very little rain that occurred during our birding time today. This morning 9/14, we headed into Texas. (I never would have guessed I would be in Texas again this year). Our destination was a National Wildlife Refuge in Oklahoma. We had a great day in spite of the fact that most of it was traveling. Our first surprise of the day was at Dalhart, Texas when 8 MISSISSIPPI KITES were flying overhead right in town. We had quite a few unexpected birds throughout the day as we traversed much grassland habitat. A Marbled Godwit at a flooded field in Texas was an unexpected bonus for the trip. We traveled on to Clinton, Oklahoma and the Wichita National Wildlife Refuge. We had an abundance of birds here. Highlights included: Yellow-headed Blackbird, Yellow-billed Cuckoo, Carolina Chickadee, Scissor-tailed Flycatcher and many more. Warblers included, Nashville, Wilson’s and Pine. Orchard Orioles were a surprise. This seems to me to be a late date, but we had three of them. The best finds of the day were more TARANTULAS than I had seen in my life. They seemed to be everywhere, and we spent a good part of our time getting them out of the roads. 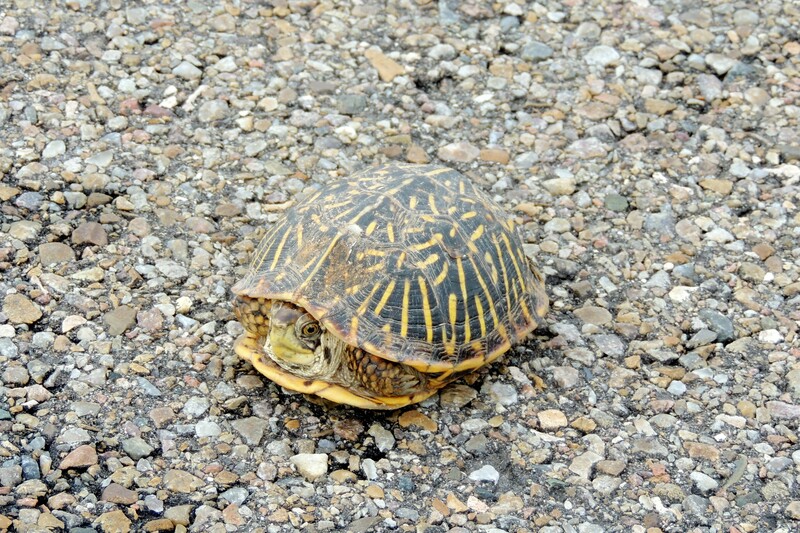 Not to be left out were the Box Turtles. They too were in the road at every turn and we rescued many of them as well. It was an interesting day, and for the first time in a week, we had no rain. Today, 9/15 , we made our way east through Oklahoma and Missouri. Our only real birding destination for the day was Wildcat Glades Conservation and Audubon Center in Joplin, Missouri. While for the most part, we are getting in to typical species of the north east, we still had some birds that aren’t typical of New York. We had many Carolina Chickadees and a beautiful KENTUCKY WARBLER. A breeding species and quite common at this spot, we only saw the one as the birds have begun migrating. Tomorrow, we head to St. Louis and some wildlife refuges in that area with some specific targets in mind. Tune in to see how we make out. From there we went to Winfield Lock and Dam on the Mississippi River. Here the highlights were a dozen Red-headed Woodpeckers and 500 American White Pelicans. Today we headed to Clarence Cannon National Wildlife Refuge near Annada, Missouri. One of our main targets for the area was the EURASIAN TREE SPARROW. We found 75 of these birds in the small town of Foley, Missouri just south of the wildlife refuge. At the refuge we had many warblers, waders, swallows and shorebirds including 2 American Golden-plover. Continuing to make our way eastward, we visited Lieber State Park in Ohio. We had many warblers here highlighted by several Tennessee Warblers and a Philadelphia Vireo. On to Lydick Road. We had many common warblers and vireos at this site. Our second Eastern Screech-owl of the trip was here as well. Today we visited Erie National Wildlife Refuge in Pennsylvania. We had a abundance of migrants here including many warblers and vireos. From there we headed home. We had a very interesting trip which had many surprises and an itinerary that was unexpected as well. The history making floods in Colorado changed our plans entirely and we were very fortunate to have escaped the disaster without any real problems. Again, we wish the people of Colorado a speedy recovery from this unfortunate event. Having re-routed our trip, we managed to get quite a few very interesting birds and make the best of the situation. I will post the total trip list in the coming days. John, I wish I knew you were going to the Pawneee Grasslands. Years ago Joan and I stayed at an excellent B&B at a ranch there and I have returned several times when I was in the area. The hospitality is outstanding as is the food and friendship of the owners. Be sure to let me know if you ever get that way again. Their place is called The West Pawnee Ranch B&B and her name is Louanne Timm. I hope the rest of the trip goes well for you all. John – Glad to see you’re out of CO…the news from there just seems to get worse and worse and I was, frankly, a little nervous about you! Thanks so much for sharing all these great photos and stories! Glad you guys finally escaped the rainy weather. 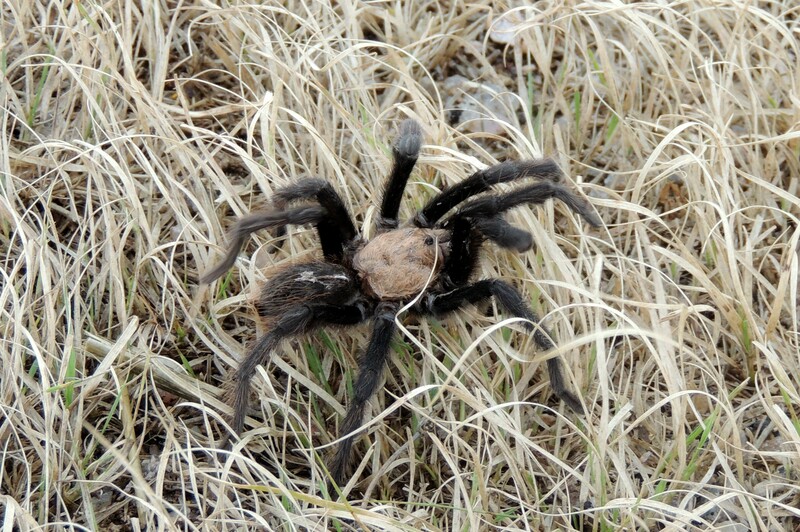 I was unaware that the US had wild tarantulas! Love the Scissor-tailed Flycatcher – great shot!